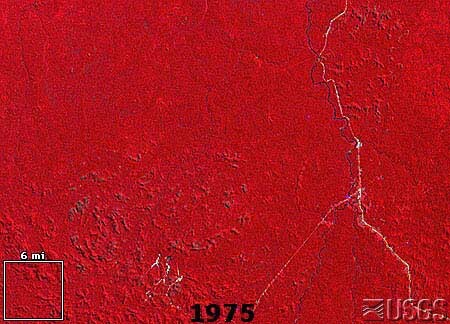 These images show the effects of deforestation on the exact same area of Rondonia (western Brazil) from 1975 to 1992. Look at the river while flipping from one picture to the next. Notice how the deforestation is most severe along the roads and around the towns. What is the large area of destruction in the top left of the 1992 image? This feature is completely absent in 1975. Perhaps it is caused by mining operations.